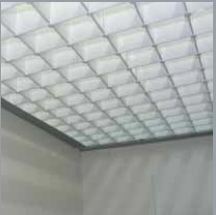 PPP false ceilings are easy to install, even by unqualified workers. However, you must follow some simple instructions for a perfect assembly as follows below. 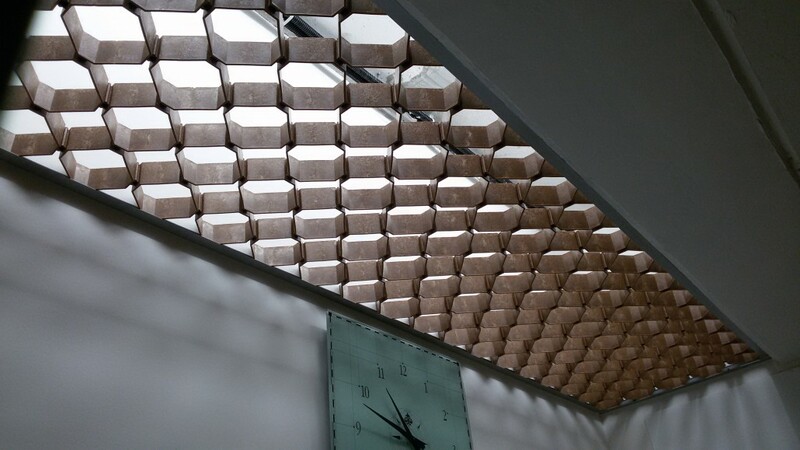 So, how to install a false ceiling? You have to apply a finishing hemline (wood, aluminum, plastic, etc..). 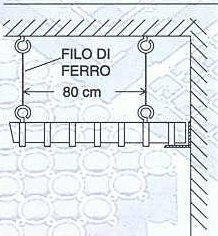 This is not made to carry weight and its job is only to hide the joint line ceiling–wall and the expansion gap that you (see below) must calculate, expecially for large surfaces. 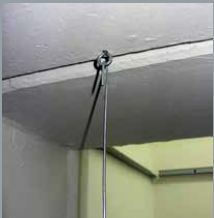 Provide for a ceiling suspension, applying plugs at regular intervals, to wich are fixed hangers in soft iron wire (not nylon wire because it does not guarantee a uniform expansion). Otherwise it’s possible to use adjustable hangers, commonly used for other types of false ceilings. The recommended distance between suspension is about 80 cm and is to be considered as indicative but necessary to ensure flatness to PPP false ceilings.In this way the average weight of about 3-4 kg per square metre is evenly distributed in the ceiling. Join some grids, respecting (important) the panel direction.The first panel will have flaps facing the walls. The facade with the holes must necessarily be upwards, to allow the correct suspension. 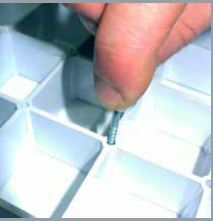 Apply a joiner eyelet in any hole on the back of a panel in correspondence of the hanger and connect it to suspend the whole. 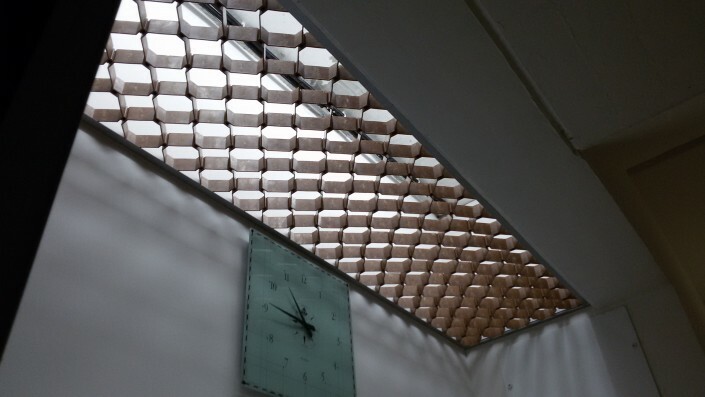 It’s not necessary to fix every single panel since the hook is extremely solid and retractable and surface becomes unique.Proceed with other panels that can be pre-assembled on the ground.The ceiling flatness is obtained by adjusting the lenght of the hanger.Just use a wood board of the desired lenght to maintain a constant level of the floor, or some laser levels if prefered. SIf you consider that by joining three panels (60 x 60 cm) is obtained, in less than a minute, a one-square-metre ceiling, you can imagine the setting speed for important surfaces too. 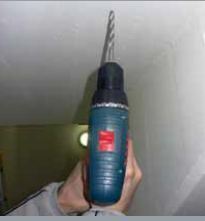 False ceilings can be easily inspected. By releasing more panels along the side of connection, you get a “window” (it’s resealable after intervention, getting in this way the initial uniform surface, differently from metal false ceilings where interventions are always visible).Hatches, skylights etc.. are superfluous. You can very easily drill or trim the panels to make them fit the room or to insert spots, pillars etc., only by using a simple hacksaw. 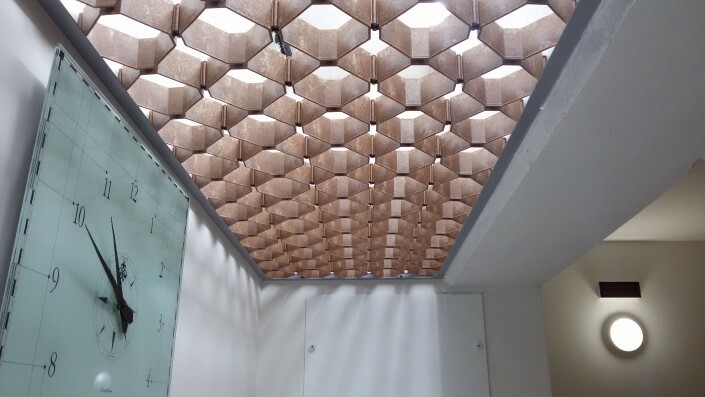 As an alternative to “free” installation, which we recommend for costs and praticality, 20×20 and 40×40 formats can be installed with the addition of mineral fiber T24 on the structure. 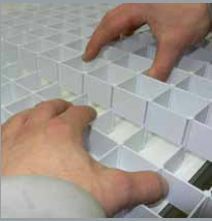 In this case panels have to be pre-assembled and trimmed to obtain these measures: 595×595 (20×20 mm mesh) or 592×592 (40×40 mesh). On request we can perform a trimming operation (with a small surcharge), in order to provide panels ready for laying. All our false ceilings are antistatic but anyway we suggest not to install them in dusty environments and only when work is completed. With large surfaces we recommend to provide, along the perimetre of the room, a thermal expansion space. The average variation is 1 mm per linear metre every 10o C. of temperature range. 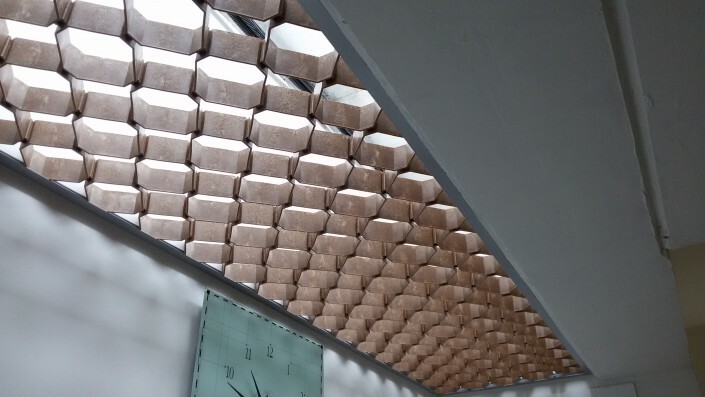 Except in some exceptional cases (installation at very low temperatures in environments getting then very hot) thermal expansion is therefore negligible.For optimum results, avoid leaving fingerprints during assembly of metallic false ceilings.We recommend use of light cotton gloves. See an overview of how to install a false ceiling. P.P.P. 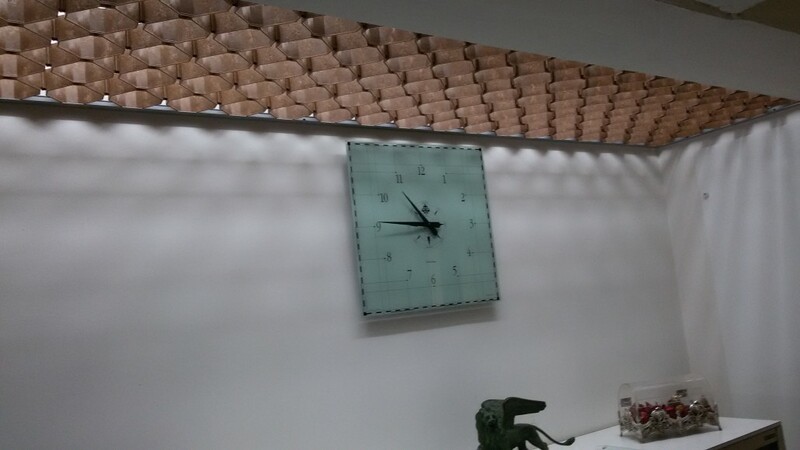 is always looking for new materials to obtain a decorative or functional improvement! Today PPP presents a new false ceiling finish obtained with a mix of 70% wood fiber and 30% thermoplastic material, that complete the recent range of special colours and finishes.This innovative creation is an amalgamation where the natural wood fiber are incorporated creating a hybrid that offers great mechanical performance, design flexibility and also an extremely attractive feeling: the advantages of wood are combined with those of the plastic material.In particular, although there is a high percentage of wood fiber, this compound is not subject to the deficiencies of the wood since it doesn’t rot or make splinters, and in the same time it resists to moisture, salty and chlorine atmosphere.It is fully recyclable, has a high level of hygiene because of the high processing temperatures and it does not require any further treatment, at the same time it is a very stable compound. 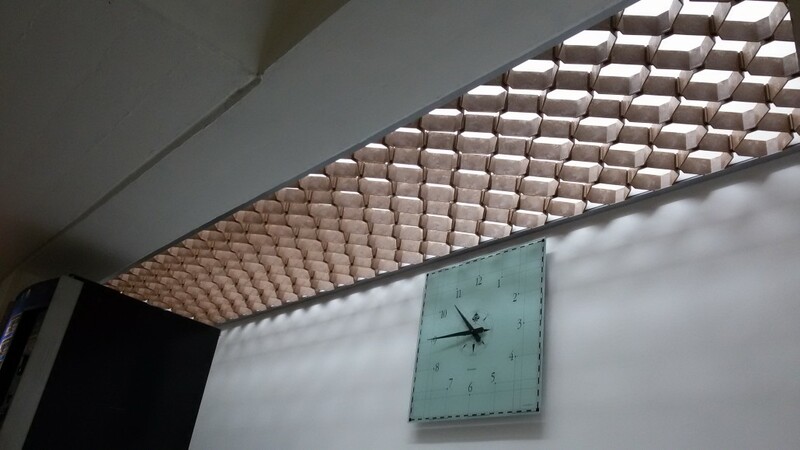 These new grids are meant to decor classic & new generation outfittings, being able to fit in all those projects where a refined interior design and higher aesthetically finish is required.